While some of you are snowed under, others are watching the flood levels. In southwest Kansas we are still enduring an extended drought. No matter what trial we are in the midst of, God is always there. Yesterday God’s handiwork began to shine as the sun came up. My early morning travels took me through the Oklahoma Panhandle, and I had to make several unexpected stops to try to capture some shots of God’s glistening masterpiece. This part of the country is dry enough, any little bit of moisture is welcome. Even if it comes as freezing drizzle in late April. It is easy to worry when the weather is so unpredictable and one is a farmer. However, Jesus has some great words in the book of Luke. How has your week been so far? Has it been a rough hard week overshadowed with disappointment? If so, how are you handling it? Do you have a gratitude attitude? We all face problems and difficulties throughout life, and sometimes we feel we are about to be swallowed by the obstacle. When we face these giants, we have a choice: 1) let it ruin us, turn us sour and apathetic, and destroy our spirits, OR 2) let it be a source of growth, wisdom, perspective and patience. Gratitude helps us see God’s presence in all circumstances. In recent years, there have been two women in my life who made opposite choices in how they dealt with their difficulties. One is a young woman, who has let the results of some poor choices turn her sour and destroy her spirit. I can’t think of a more negative person. Whenever I see her, I give her a smile and try to encourage her, and I am always met with negative comments. This poor girl has absolutely no joy. The second woman died of cancer. When healthy, she was always a very sweet person, but let me tell you about when she was sick. She was polite and pleasant, thanking the nurses, doctors, and anyone else helping her. She was a favorite among the hospital staff because as they cared for her she cared for them. She would ask about their families, and then pray for them. Next time they’d be on duty, she would follow up on that conversation and again say, “I’m praying.” Visitors would begin asking her how she was, but she immediately turned the conversations to them with sincere love, interest and concern. No matter how much pain she was in, she always had a smile and an encouraging word for her visitors. She was quick to share her love for God with anyone who would listen especially as death grew near. The second lady had a gratitude attitude. She was grateful for the little things in each day. She did not take them for granted, but saw them as gift and blessing from God. Whatever your week has been like, it’s time for an attitude check. Do you have a gratitude attitude? A young girl found the soft side of Hubby at church last week. She had a cat that needed a new home. Some people are drawn to the love of an animal especially if you can hold and pet it. However, my husband does not and I have never known him to fit that description. 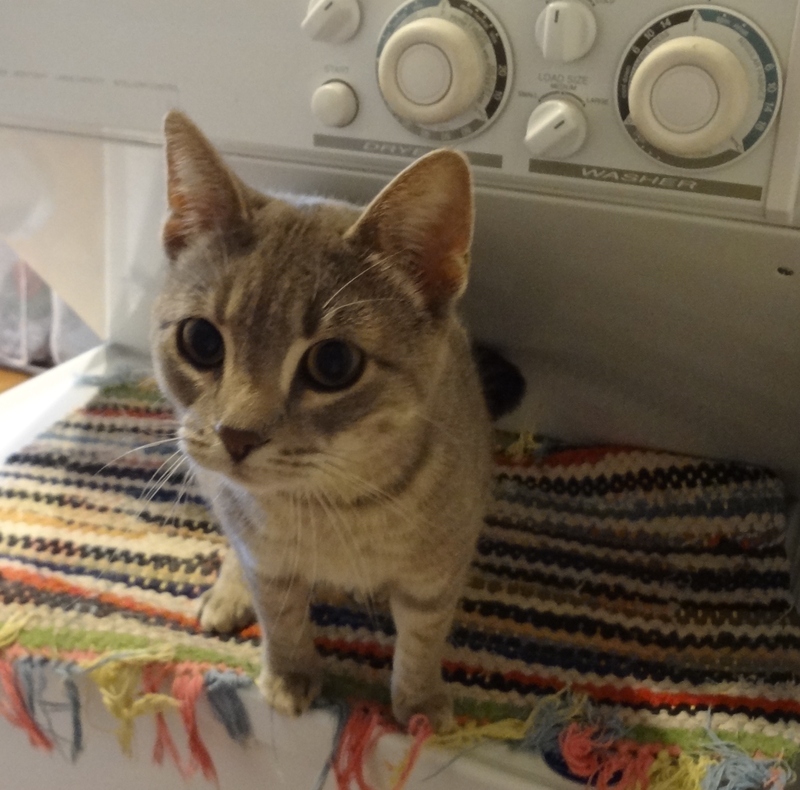 So what was it about this cat or this little girl that caused Hubby to quickly agree to give this cat a knew home? Last week at Awana (kids Bible club), Hubby shared pictures and stories about his recent trip to Haiti. Afterwards, a girl approached Hubby with a sad look on her face and began telling him about her cat. She told him how tame and sweet this cat was, and that it was pregnant. She then said “I have to find a new home for it right away, or Mom and Dad will get rid of it.” Without much hesitation, Hubby asked if next week would be soon enough. She said yes and that she would bring the cat to Awana. When Hubby was retelling this to me, I had questions flying through my mind making it hard not to interrupt. You see, we like to have barn cats to control the rodent population, but when it comes to indoor cats that is a different story! After stating the brief conversation my question/answer dialog began. Fast forward one week….Last night a young girl brought a cat to Awana, and took it straight to Hubby! We brought home a very tame, quite pregnant, declawed house cat. It’s new home is our garage. When the kittens are old enough they will become barn cats. I don’t know how I feel about having a cat in the garage all the time. Do you have any suggestions or advice? In case you didn’t notice, Hubby’s decision had nothing to do with the cat. Not at all! Rather, it was about a young girl with sad eyes, pleading for help. That my friends is where my sweet strong husband’s soft spot is. Helping someone in need – especially a child. How I love that man! 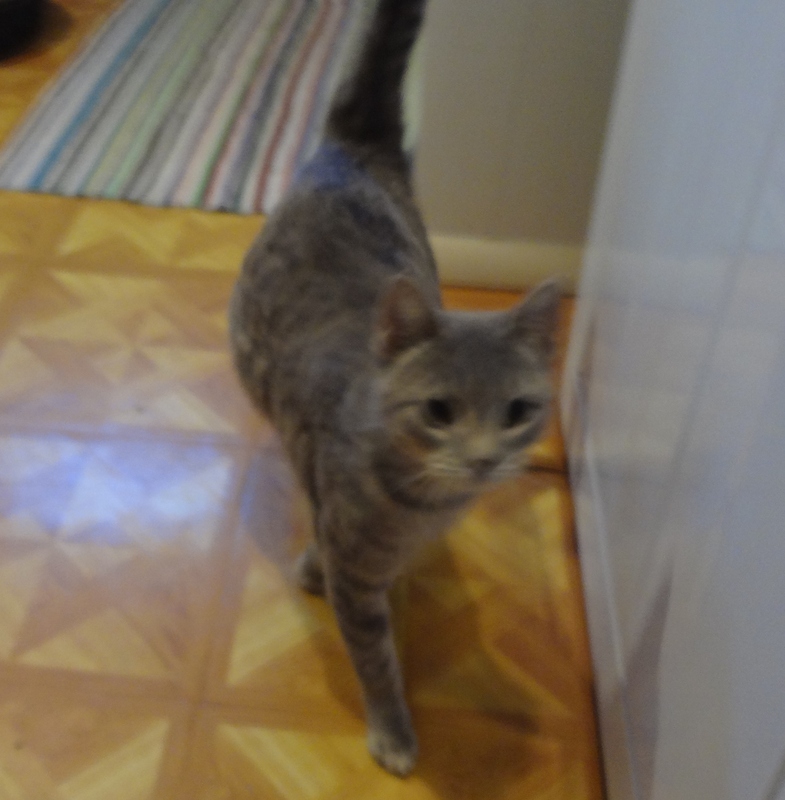 Our new cat – We don’t know her name yet. Parenting is quite possibly the most challenging AND most rewarding job one can have. Hubby and I have four grown children. The fourth was born when the first was 5 years old. That led to having four teenagers for 1 1/2 years. We were/are not perfect parents, and we did not have perfect children. We were like many of you – raising and teaching the best we knew how. For the past several weeks, Hubby and I have had the privilege to lead a study called “Shepherding a Child’s Heart” by Tedd Tripp. This study has been encouraging and humbling as well. Some of the information has come 20+ years too late for us. However, we have been able to share from our experiences with the young parents in this class. The focus of the study is learning how to speak to the heart of your child. Helping your children make right choices from their heart rather than making those choices simply to avoid discipline. The things your child does and says flows from the heart. The parents’ goal should not be a well-behaved child, but one that embraces the gospel and continually grows in relationship with Jesus Christ. We have had some great discussions in our class. Would you like to learn how to shepherd your child’s heart? If you are in the Meade, KS or surrounding area, I would be more than happy to lead another class. Just let me know if you are interested. I love to set a pretty table and pamper family and friends when they are here for a meal. That was only one reason I was excited some of the family would be here Easter morning. It gave me reason to try a new recipe and create a full brunch menu rather than our traditional Sunday Coffee Cake.Would you like to know what I served? The fruit bowl was no ordinary fruit bowl. 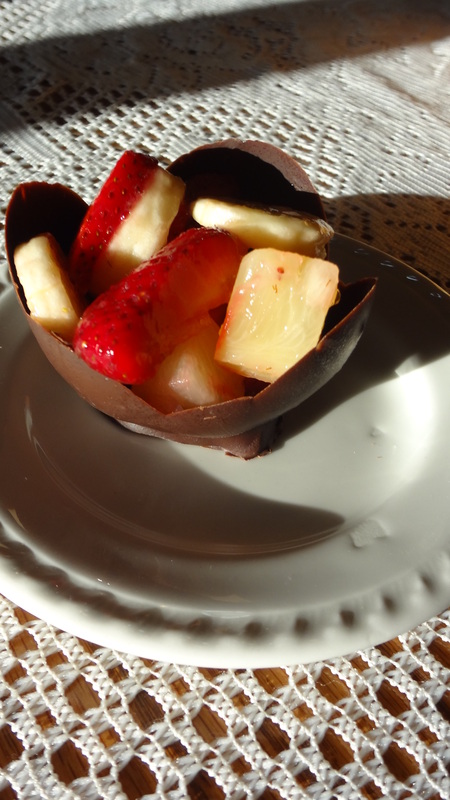 It was a Chocolate Flower Bowl filled with fresh fruit including the first big juicy strawberries that I have seen this spring. You can find tutorials for making the chocolate bowls all over the internet and probably Pinterest. However, they leave one very important step out. This step is crucial to having a chocolate that shines and snaps rather than being dull and chewy. The secret is “tempered” chocolate. This is a slow process and one must take care to keep an eye on the temperature of the melting chocolate. Although it is more tedious and time consuming, it is well worth the results. The Easter Egg Surprise had nothing to do with hard boiled eggs. It was simply mini cinnamon rolls that I made in my little tart pans. 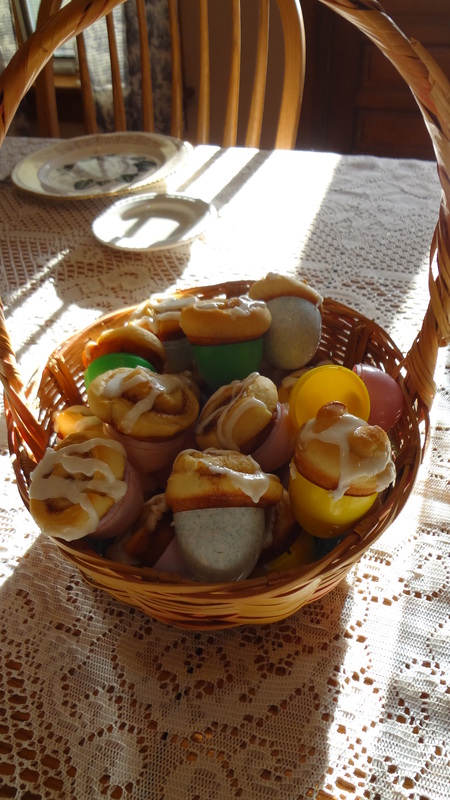 Then they were placed inside plastic eggs for serving in Hubby’s childhood Easter basket. Oh, don’t worry; I DID wash the plastic eggs before using! I was searching on a favorite website for my main dish. Taste of Home has tried and true no-fail recipes, and that is where I found the perfect recipe: Blueberry Blintz Souffle (http://www.tasteofhome.com/Recipes/Blueberry-Blintz-Souffle) The blintz cheese filling is what made this souffle so much more than a souffle.I would highly recommend this recipe. I was concerned about the leftovers, whether the souffle would weep, and would reheating affect the texture. I observed no weeping, and it was just as delicious as the first serving. I did alter the blueberry syrup. 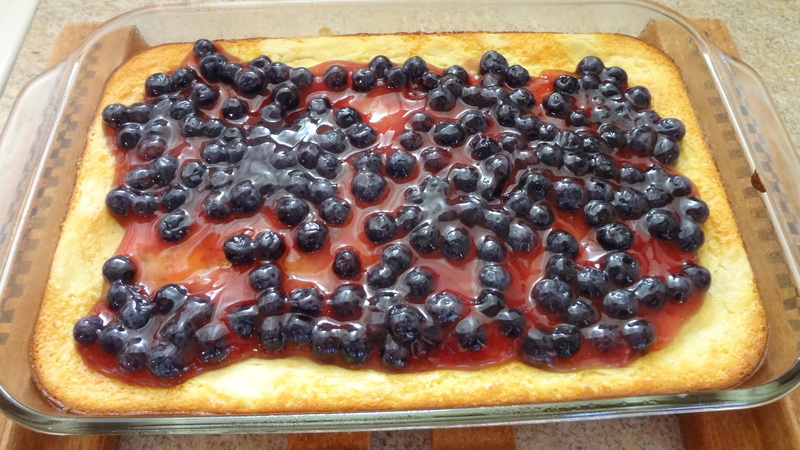 I substituted frozen blueberries, sugar & water in place of corn syrup, and clear jel instead of cornstarch. We all liked this dish, in fact seconds were passed around. So often the words food and fellowship go together. Sunday morning was no exception with food and fellowship shared around the table for Easter Brunch. After a couple beautiful days in the 70s, these cold damp days are not so welcomed. 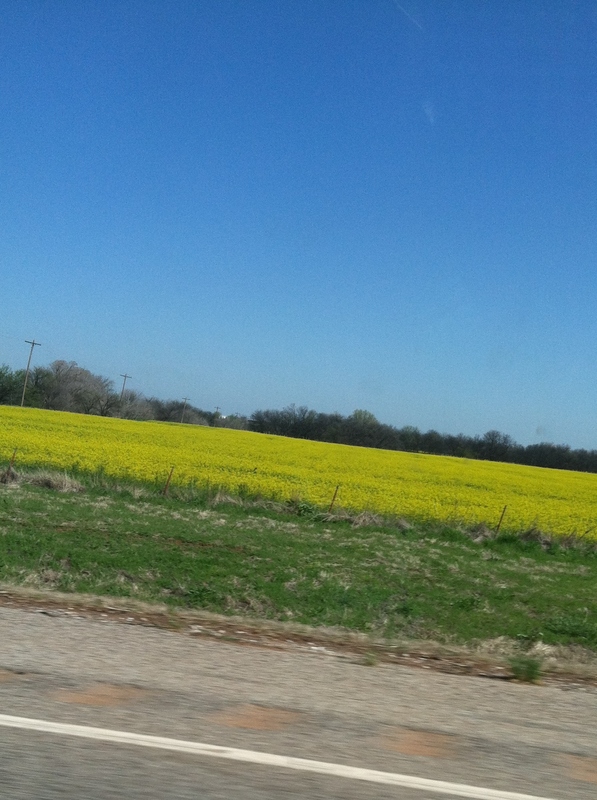 Yet this is what God has blessed us with. Blessed? Yes, blessed. In our dry and thirsty corner of the state, damp is better than hot wind, and although I prayed for rain, wet snow melting-where-it-lands is better than nothing. Now I’m going to have to wash the car. It’s only enough to make things messy. There’s not enough moisture to amount to anything. I had to pick up the kids. They couldn’t walk home in this. Ugh! I just wish winter would go away. Shame on us! We can be such ungrateful spoiled brats.